The University of Northern Iowa and the City of Cedar Falls have joined forces to provide a city/university collection site on the UNI campus. Located west of Hudson Road, the site is north of the UNI Power Plant on the west side of Panther Parkway. The city purchased nine roll-off containers, eight of which are currently used for recycling at the site. Set on concrete pads, they will accept household recyclables; including plastics coded 1 through 7, plastic grocery bags, clear and colored glass, tin cans, office paper, cardboard, newsprint and magazines. The city assisted with site development and improvements. The university provides site surveillance, grounds maintenance and trash removal. For more on the recycling substation, contact Brian Heath at (319) 268-5575. 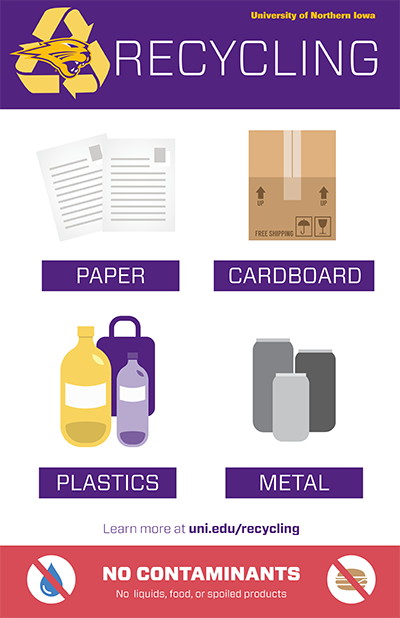 The University of Northern Iowa has an active paper recycling program. 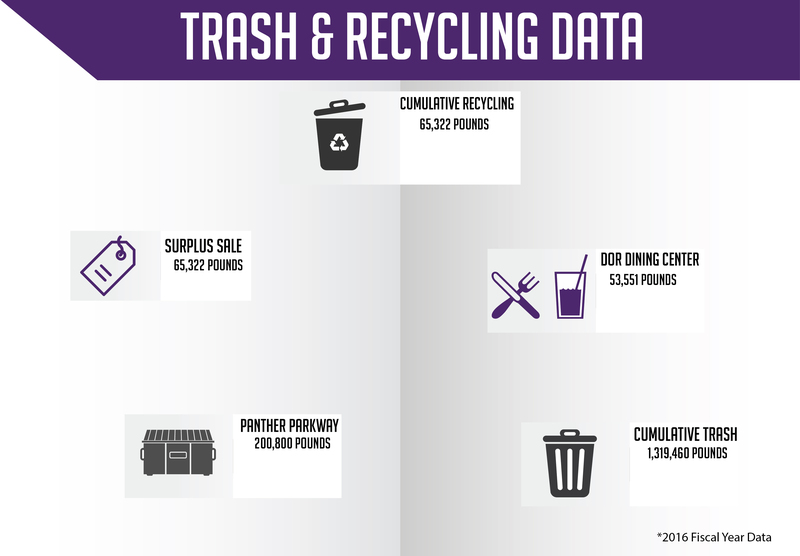 Approximately 250,000-350,000 pounds are recycled annually from academic buildings. In most academic buildings there are generally two waste receptacles at work stations, one dedicated to paper and the second for all other refuse. The custodial staff maintains both receptacles, sometimes on an alternate night basis. Transportation Services moves the paper from the academic buildings to the compactor at the West 27th Street warehouse. Virtually all paper items may be recycled in this manner including phone books. Campus Supply recycles old printer ink cartridges. To recycle, send printer cartridge to mail code 0193 and mark the cartridge "recycle". Rechargeable batteries under 2 lbs are also recycled. This recycling system saves UNI money. The Department of Residence has a collection system in place at University residence halls for mixed recycling. UNI has 6 Big Belly Solar Kiosks at high traffic areas on campus. The kiosks contain a Big Belly solar compactor flanked by two recycling containers for mixed recycling. Additionally, there are 6 standalone Big Belly solar compactors near other major crossroads on campus. 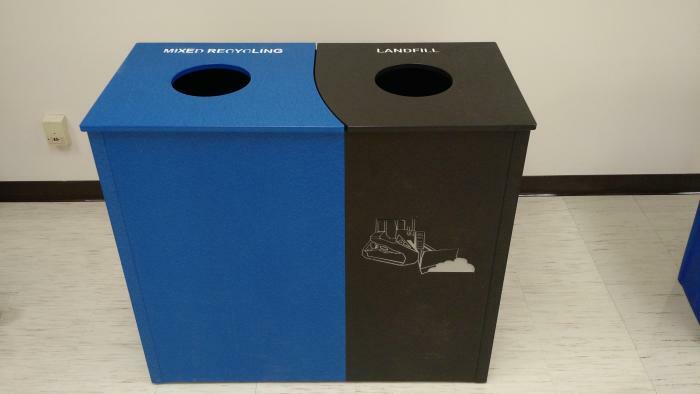 These compactors both reduce campus litter and the time our Grounds staff spends emptying the containers. The recycling containers further enhance opportunities to recycle. Please see the UNI Office of Sustainability for additional resources. While the University has a number of recycling and sustainability efforts, actual waste is taken to the Black Hawk County Landfill (usually via the City of Cedar Falls Transfer Station at 15th & State Streets).